Set up your DentalXChange Account for Patient Statements (see below). In Open Dental, enter electronic billing credentials and address information. You can enter information for a single location or by clinic (see below). Click Send. Bills with a mode of electronic will be sent to DentalXChange. Please use Open Dental version 15.4.46 or greater or 16.1.10 or greater. We have asked DentalXChange to not troubleshoot any failed statements for earlier versions. The solution is usually to update to the latest stable version of Open Dental. Electronic statement format differs from Open Dental statement format. If statements are many pages, you may want to print them to avoid extra charges. Electronic statements do not show as much information about payment plans and installment plans. To send statements to single patients instead of the entire family, print statements instead. Electronic statements always show family members intermingled. Printed statements show a better breakdown by patient. Click Account in the top left hand corner. 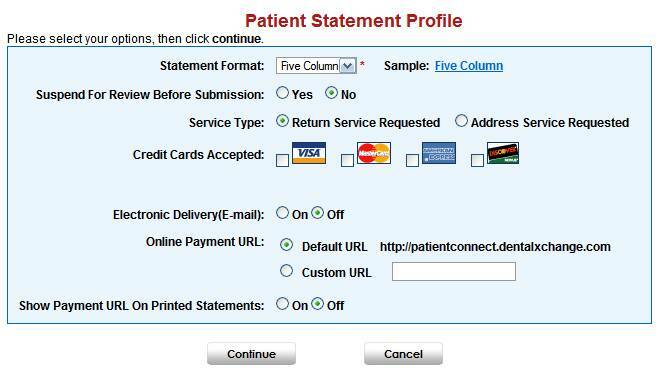 Select your patient statement profile options. When finished, click Continue. If you choose the Electronic Delivery (Email), be sure to send them your email address. Below are instructions for setting up electronic billing credentials for a single location. If using Clinics, you can set different credentials for each clinic. See Enter Clinic-Level Electronic Billing Credentials below. In the Billing window, or from the Billing List, click Defaults in the middle right. Note: If accessed from the Billing List only the Electronic Billing section will be enabled. In the Electronic Billing section, select Dental X Change. Select the Credit Card Choices accepted by the practice for payment. Enter the vendor ID and PMS codes below. Enter your login credentials provided by DentalXChange (Account Number, User Name, Password). If you are also using DentalXChange for e-claims, your username and password will be the same. Note: If you change the user name and/or password here, you may also need to change it in clearinghouse settings. Generate PDF: Determines whether or not a PDF version of each statement will be generated and saved when the statement is sent. PDF versions are saved in each patient's Images module, statement folder. If you uncheck this option, a PDF will not be saved, and there will be no visible record of sending. Checked: A PDF version of each statement will generate and save in each patient's Images module, Statement folder. Unchecked: A PDF version of each statement will not be generated or saved. This speeds up processing and is useful for offices who experience slowness when sending batch statements. Select the address that will show on the statement. The selections are based on entries in Practice Setup. Practice Address: The address to use as the practice address. Remit Address: The address the payment should be sent to. URL Override: See Troubleshooting below. When using Clinics, you can enter different credentials and addresses for each clinic. In the Billing window, click Defaults in the middle right. Credit Card Choices: Select the credit cards accepted by the practice for payment. Clinic: Select the Unassigned/Default clinic, then enter credentials and address information. These settings will be used by all clinics if no clinic-level overrides are entered. Account Number, User Name, Password: These are provided by DentalXChange. If you are also using DentalXChange for e-claims, your username and password will be the same. Practice: The address to use as the practice address. The selections are based on entries in Clinic List or Practice Setup. Generate PDF: Determines if PDF copies of each statement are saved in each patient's Images module, statement folder. We recommend always generating a PDF so you have a record of statement information sent to the patient. Checked: A PDF version of statements will generate and save in the Image module. Unchecked: A PDF version of statements will not be generated or saved. Enter clinic-level credentials and address information. These settings will override Unassigned/Default information when sending statements for this clinic. When finished with one clinic, select another clinic and enter its information. Click OK to save all settings. If the currently logged on user is restricted by clinic, only the clinic they have access to will show in the Clinic dropdown. If Unassigned/Default credentials match other clinic settings, and Unassigned/Default credentials are modified, the edits will affect the other clinics as well. To unlink a clinic from Unassigned/Default, simply change the clinic's credentials. Then any changes made to Unassigned/Defaults will no longer affect the clinic. This means the remit address is incorrect or missing. Select the remit address option that best fits your practice, then verify the address is correct in Practice Setup or Clinic Setup. Repeated failures when sending e-statements. A possible solution is to change the URL override (where statements are uploaded).